Transition to Teaching is a two-semester program created by Indiana lawmakers to prepare career professionals with bachelor degrees to teach middle or high school classes. Qualified individuals may enroll as non-degree candidates at institutes of higher education and pursue a program of courses and experiences. GPA of at least 3.0, both in the language and overall OR MA OR BA with 2.5 GPA, both in the language and overall, AND five (5) years of professional experience. Course needed: 18 hours of teacher education program coursework. 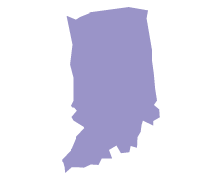 Upon completion of all Transition to Teaching Program requirements, the Indiana Developmental (Pedagogy) Area Assessment: P-12 Education, and 2 years full-time teaching, the candidate may apply for the Initial Practitioner License. Transition to Teaching programs are based on the premise that the candidate already has content knowledge in the licensing area. Each accredited education institution is required to offer or be in collaboration with other institutions to offer a Transition to Teaching program. Praxis I and II may be required for admission to a program. The programs consist of 18 hours of coursework for secondary education and 24 hours for elementary education. No education courses are required as prerequisites for admission.